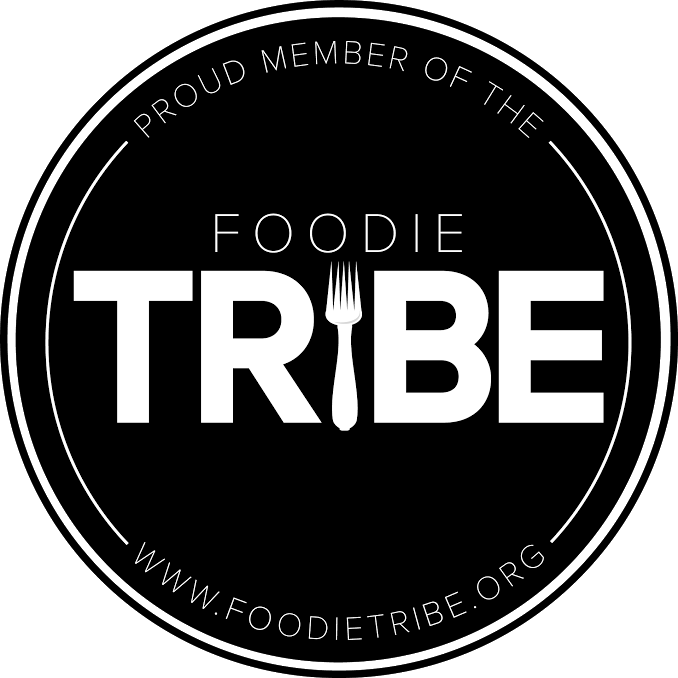 I've complained before about my favorite restaurants closing as soon as I declare them favorites. It happened with Purim Oak, it happened with Bangkok Place. More recently, it happened with Yeti, a little hole-in-the wall carry-out on York Road between Belvedere and Northern Parkway. They served pretty decent pizza and good Indian/Nepalese food and most importantly - they delivered. When Mr Minx and I felt lazy about dinner, the biggest decision we had to make was "Indian, or pizza?" Not long after the demise of Yeti, B'More opened in its place. Had they bothered to stuff our door handle with a menu, we would have tried B'More months ago. As it was, we were pretty much completely oblivious to its existence, until I happened to notice they were getting a fancy new sign installed on the front. A Google search revealed a Web site with an online menu linked to a site at which one could place and schedule pick-up and delivery orders with restaurants in cities around the country. The hot weather gave us an excuse not to cook, so I placed the order early in the afternoon for a 6pm delivery. B'More's menu is pretty extensive. Not only do they have "Pizza Subs & Kabab," they also have quesadillas, gyros, wraps, lasagna, tuna fish subs, wings, and Indo-Chinese food. Wait, what? "Indo-Chinese" food? Yup, and we tried some. 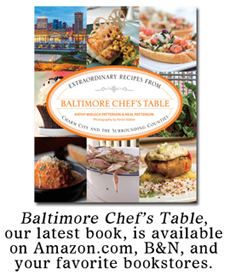 We tried several things, actually, just to get an idea of what B'More could do. 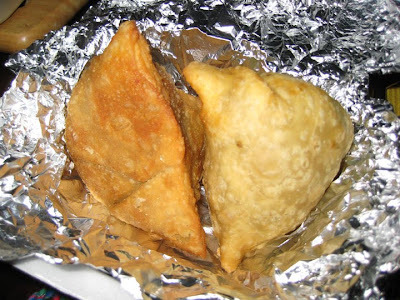 We started off with vegetable samosas, which came with the customary tubs of cilantro and tamarind sauces. Rather than the usual chunks of potato and peas, the filling in these was a bit more of a mash. But they tasted good and the wrappers were still crisp, even after being wrapped in foil and stashed in a styrofoam container. Everything came like that - well-packaged. Usually a delivery bag is wet and soggy by the time it reaches our house after sloshing around in someone's car for several minutes, but this one was neat and dry. The two saucy entrees were packaged in plastic containers with lids, and the dry one had styrofoam. The garlic naan was wrapped in paper and foil, so it left no greasy spots. Mr Minx was in an Indian mood, so we tried the lamb curry. I ordered it mildly spiced, and it was indeed mild, with small nuggets of lamb in a tomato-y sauce not unlike tikka masala. 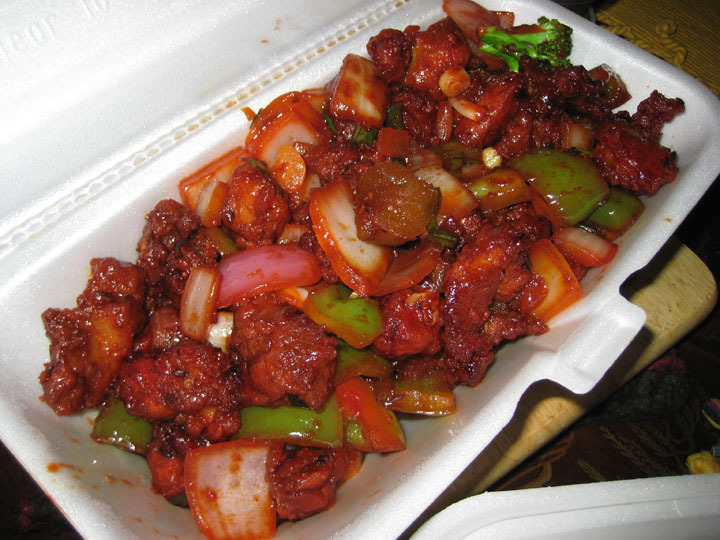 We also tried the Chilly chicken, one of the eight Indo-Chinese dishes on the menu. We had the option to have it dry or sauced, and I thought we should try the dry version first. The dish was very interesting, with a smoky quality to the meat that reminded me somehow of New York street food (although I haven't eaten much besides hot dogs and chestnuts). The chicken was probably cooked in the tandoor before stir-frying with onions and green peppers, although it almost seemed to have a thin breading on it as well. In any case, we enjoyed it and would order it again. 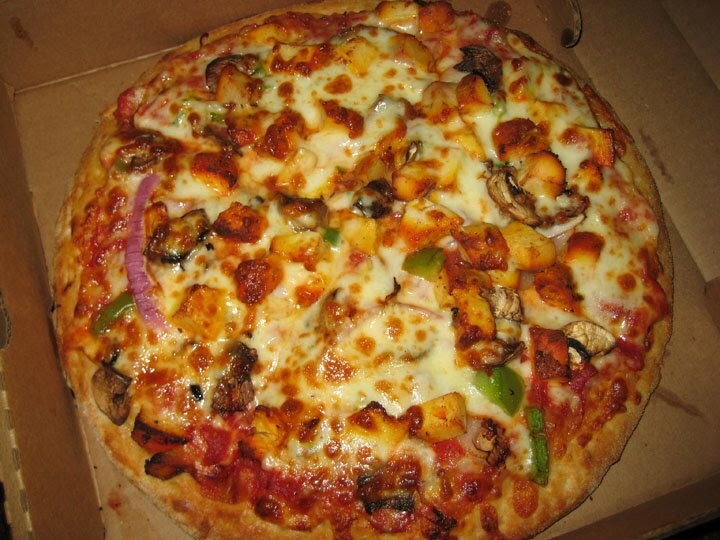 We also tried a 10" pizza - a tandoori chicken one, to keep with the Indian theme. At first bite, both Mr Minx and I were simultaneously transported to our childhood. We weren't sure if it was the flavor of the cheese, or the crust, but the experience was a little eerie. In any case, the pizza was pretty good. 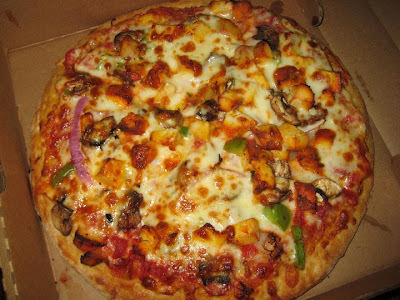 While the other pizza varieties have three crust choices (regular, thin, pan), the tandoori chicken was only available with the regular crust, that is to say, the type of crust that seems most prevalent in delivery pizzas today, one that is neither thick nor thin. It was well-cooked, with color on both the crust and the cheese, as it should be. 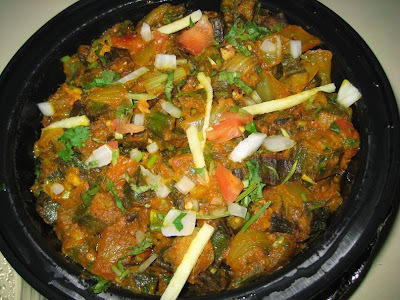 Finally, we got an order of bhindi masala, an okra dish. It's fairly rare to see okra on menus around here, and I thought it would make a nice side dish for the tandoori chicken I planned to make over the weekend. 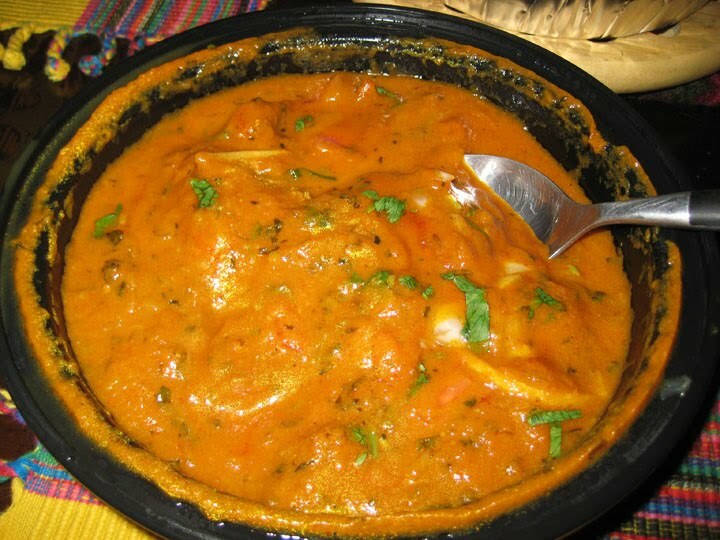 It was nice and chunky with vegetables and had a mild flavor that harmonized well with the creamy chicken. We ordered a ton of food, but it was several meals' worth. The bulk of the pizza went into the freezer for a later date, and my samosa and some chilly chicken were saved for the next two days' lunches. And the container of rice that came with each entree (about a quart, in all) gave us a several days' worth of starch. The verdict? The food was good, the delivery was absolutely on-time, and the driver was extremely nice. When I opened the front door to get the food and sign the credit card receipt, our dog Milo decided to run outside. I panicked, yelled "grab him!" and ran after the dog. The driver had a better idea and went into the house, holding the door open and taunting Milo, figuring he would rush inside after him. Which he did, growling the whole time. On that basis of that interaction alone, I'd order from B'More again. But the food is worth trying, and I'm sure we'll be placing another order or three before the summer is over. gonna have to try it. I wonder I they will come to my house off lock raven and taylor? Hey you're in Bmore? COOL! I came here via David Dust's Top Chef posts. Forgot to add - for chilli chicken, the chicken is generally coated with cornflour and fried before adding to the base I mentioned before. The cornflour on the chicken would explain the texture I sensed while eating it. I'm hoping to try the other items on the menu, although they seem largely limited to variations on fried rice. I agree minxeats. b'more is good. I tried their chicken tikka masala. it was fabulous.